Linda Crichton Miko and Mary Lou Crichton George, with additional information from Ruth Filip. Photo courtesy of Linda Crichton Miko. 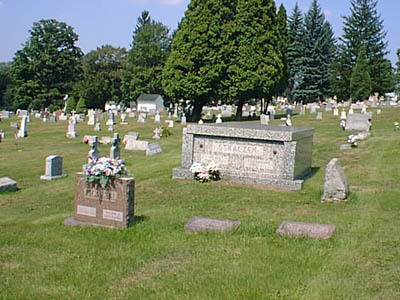 Sacred Heart Cemetery is located in Portage Township, on Cemetery Road. The cemetery is affiliated with Sacred Heart Church on Mountain Avenue in Portage Borough. The church was built in 1909 at its present location. The coal industry drew many Polish immigrants to Portage in the early 1900s and many of them wanted a church in which Polish would be the primary language. The church has a rich history and is currently under the direction of the Reverend Father Ronald Osinski. As order of the Diocese, Sacred Heart Church has joined with Assumption of the Blessed Mary Church to form one parish known as Our Lady of the Sacred Heart. The Sacred Heart of Jesus Garden Mausoleum is located on land toward the bottom of the cemetery. BELTOWSKI, Jozef 19 Mar 1855 3 Mar 1924 TU SPOCZYWA S.P. CHROBAK, Amelcia 4 Czek 1914 3 Pazd 1920 TU SPOCIVA S.P. CORDEK, Frances M. 1932 2003 MOTHER; w/o Victor C.
CORDEK, Victor C. 1927 1972 FATHER; PFC 92ND ADRM SQ VFC W.W.II; h/o Frances M.
GAWEL, Stanislaw 1868 1923 TU SPOCZYWA S.P. HARENZA, Jozefa 7GO WRZE. 1918 R. 15GO STYCZ. 1938 R. WIECZNY ODPOCZYNEK RACZ JEL DAC PANIE. TU SPOCZYWA S. P.
HOMERSKI, Maciej 1890 1918 TU SPOCZYWA S.P. ; W.O.R.M.D.P. KOENIGSBERG, Anna M. 14 Oct 1915 6 Mar 2002 w/o Michael M.
KUNKO, Adam J. 1923 2002 US ARMY AIR FORCE WW II; World War II marker; h/o Helen M.
LAYO, Joseph E. Jr. 26 Dec 1943 4 Oct 1963 Separate military stone engraved: JOSEPH LAYO - PENNSYLVANIA - AB US AIR FORCE Grave shared with LAYO, Joseph F. and David J.
LYNDECKI, Andrzej 17 Sierp 1879 8 Stycza 1920 TU SPOCZYWA S.P. MASTALER, Margaret R. 26 Jul 1915 16 Sep 2002 Wedding rings engraved on stone APR 17 1937; w/o Francis A.